Rachel is learning to swim. She’s not afraid to go under water. She’s not afraid to jump in. Her confidence is greater than her skills. But she doesn’t want to stay still when she’s supposed to be floating. She gets in position to float, and then wiggles around, which forces her to sink. Instead of surrendering to stillness that brings control in the water, she wants to take the action into her own hands, which actually gives her less control over her body. Sometimes I’m like that with my faith. Instead of being still and letting God work through me, I want to fix and do and plan and control. But God has been teaching me about living rescued and resting in faith. For me, resting in faith often means slowing down. This is what’s hard right now for me: Besides not knowing what I should do more times than I care to admit, parenting exposes all my own sin, which is just plain hard, especially when I’ve got a family depending on me. I need to let God change my defense mechanisms. Naturally, I want to fight it — everything — which can come across as mean and cold when really I’m just afraid and uncertain. I want to move faster and bark orders like I’m in the one in control and rush any soul work God is in the midst of doing. I fight the wrong enemy with human words rather than the spiritual battles with Christ. On bad days, I fight my son’s behavior instead of teaching his heart, choose to worry about what might happen instead of trusting the God I know, and allow frustrations to replace truth. stretch out my arms, and float on faith. #PorchStories friends, earlier this week I shared my review of Kate Motaung’s “A Place to Land: A Story of Longing and Belonging” and am giving away an autographed copy. Be sure to enter to win! I’m learning that exact same lesson right now, Kristin. I’m still asking, seeking, and knocking, but God is teaching me how to do it from a position of trust rather than striving. It’s a hard lesson to learn after decades of high achieving, but I know He will teach me well. It’s definitely a hard lesson, but I’m so thankful God keeps working with us. I’m glad you’re here, Sarah! God is using so many things to encourage me to trust God, and not keep myself afloat. But, goodness, my natural tendencies distract me sometimes. I’m thankful for his grace again and again. I’m thankful for your encouragement during this season especially. xo. It’s always interesting to me how God drives things home for us at just the right times. Whether it’s something we hear, read, see or even just someone we run into, He always knows just what we need. And this idea of living out of rest sounds like balm to my soul! God knows my soul and mind need the repetition. I’m so grateful for His timing and provisions. Thanks for being here, Becky! This stood out likely because I just finished a study of Ephesians and have also been reading a book that speaks to this too. I’ve been thinking of you lots as I dive back into writing and as I read different articles. One recently on Facebook and finding a community group to be part of… of course I thought of yours. Not sure why I’m hesitating to jump back in (groups, link ups, etc). But again, when I think of both I think of the beautiful communities you have formed. Hugs to you friend. Miss you. I love Ellie Holcomb’s music. And, because I learned to swim in my twenties, I still remember that feeling of learning to float and trusting the water. Thanks for this parable today! Rush turns to ruin. THAT speaks to me. The photo of Rachel floating so still is beyond precious. It is still speaking to me too. I’m glad you’re here, Susan! What a great analogy! We so often think everything depends on our efforts rather than resting on Him. I’m certainly of trying and striving before trusting. 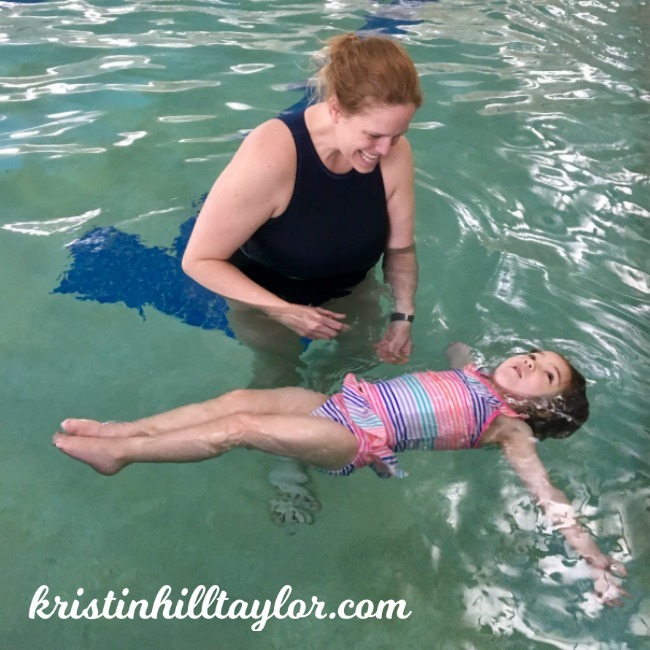 Watching my girl learn to swim has been so encouraging to my faith. Thanks for being here, Barbara! “Red Sea Road” is such a stellar album. I cannot get enough of it…and it truly got me through last Spring/summer when I unexpectedly had job change in my life etc. I need to listen to that Tauren Wells podcast. I have heard such great things about it. It’s also an album that I come back to over and over again, and I get the feeling it will always be like that. I’m glad you’re here, Tara! Oh, yes, I get that. And sometimes I dismiss the value of the small chunks of rest, but they’re always worth it. I’m glad you’re here, Lisa! Love the word picture of floating! Thanks so much. And for always sharing your resources. Hope you love some of those resources like I do! Thanks for being here, Lauren! I really need to sink into what I know, too!! Your posts are so practical – and a blessing! Have a great weekend! Oh that’s nice of you to say, Jennifer! Thanks for being here!